Today in this article I will be sharing a simple method of Gmail Strikethrough, We often feel a need of adding a strikethrough text in Gmail. However, you may have noticed that there is no such option. Even there is no option to bold a text or make it italic. Hence for a really long time, you may have thought it is impossible to add adding a strikethrough text in Gmail.Also, you may have noticed that it is also an impossible thing to make changes in the compose mail box. Step 1: First of all open the Microsoft Word Application, if you do not have Microsoft Word installed on your computer then you can use the WordPad application. Step 2: Now type down any word you want as it is for tutorial purpose. Step 3: Now from the top menu, you will see an ABC icon. Step 4: So at first simply select the word that you have typed then click on the ABC icon. Now you are done with adding a strikethrough text in Word file. Now coming back to the topic of “how to strikethrough in Gmail”. Step 1: At first you have to open Microsoft Word or Wordpad. Step 2: Then you have to type down your email text that you would like to send. Step 3: Now select each and every word or sentence and make it a strikethrough text same as explained above. Step 4: Once you are done preparing the whole email simply copy it. Step 5: Now go back to the Gmail and click on the compose button from the left menu. Step 6: Now simply paste the email that you have copied and you are done. Step 7: That’s it now you are done with strikethrough Gmail. Step 1: First of all open the Google Web Store. Step 2: Then search for the Strikethrough, Etc. Chrome extension and install it. Step 3: Now go back to the Gmail compose tab. Step 4: Now type down the text that you want to make strikethrough. Step 5: Now select the word and right click on it and then go to Strikethrough, Etc option. Step 6: Then click on the Strikethrough option. Step 7: After that, you have to select the Short Strikemple option. So that was all for your question that says “How to do strikethrough in Gmail.” In case if you have any questions then comment below and we will surely help you out. Strikethrough in Gmail is very easy to do and you can simply strikethrough text in Gmail by following the step by step guide given above. 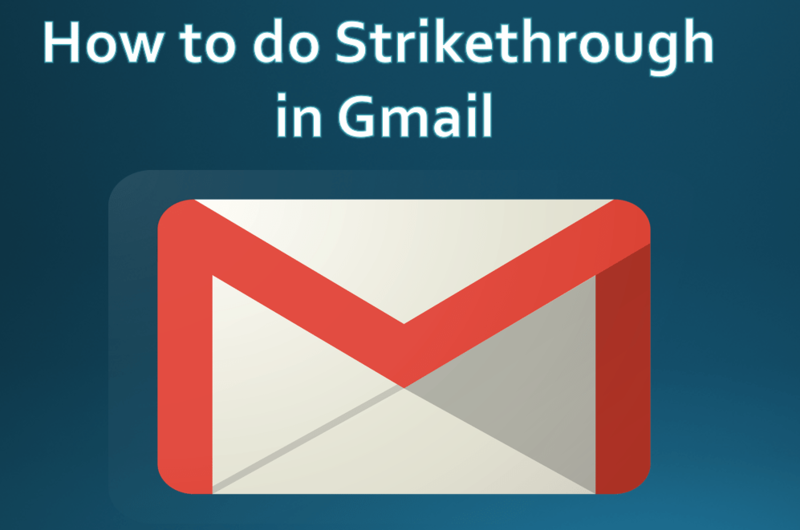 I hope this article resolve you’re all the queries related to “How to strikethrough in Gmail” if you still have any difficulty then let me know in the comments below. If you like this article then don’t forget to share it with others on social media.